So check out these tips from Dave Ramsey to help you out on your financial journey and let me know what you think! This is Dave Ramsey’s first money saving tip. He believes creating a game plan/monthly template will help you manage your finances better. His app, EveryDollar is a great way to help you keep track every week and month on where you money is actually going. You want your money working for you, not the other way around. Ramsey is of the idea that if every individual decided to take into account of the amount spent on monthly grocery shopping, we would come to realize just how much money goes out the door. He thinks meals should be planned before trips to the store are taken. That way we can go for only the necessaries and reduce the rate of overspending. Ramsey thinks if you are trying to save some money, you shouldn’t be paying for unnecessary subscriptions. Cancel the subscriptions you don’t use frequently and when your budget permits, renew them. David Ramsey recognizes this as one of the core factors that deter people from saving. He suggests what he terms “the debt snowball method.” Here you pay your debts from the least to the highest. It’s a great way to keep yourself motivated when working on getting out of debt. Physiologically it helps us to feel great when we pay off one, and then it builds momentum for the other debts. He is of the idea that brand names only sell what they are, “brand names” and generic products are way cheaper and can help you save a lot of money. This is widely recognized as one of the best ways to save money so it is no surprise it makes Ramsey’s list. Ramsey suggests there is a plan for calculated deductions for every payment you collect (based on your salary). Some equipment that you need for a menial task doesn’t need to be bought! Borrow from a friend or family member and save money. This is quite straightforward. By going to work with your lunch, you can save what you would have spent on food. There is definitely no harm in finding out if you can pay less for stuff! Resisting temptations will be easier when you are not constantly presented with what you are trying to avoid. Unsubscribe from those emails to help you avoid impulse buying. 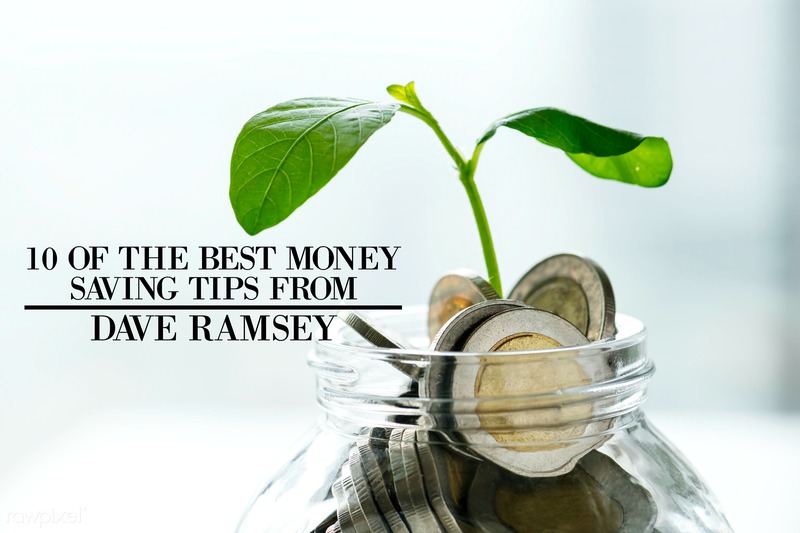 Now if you have any questions about these Dave Ramsey tips, just let me know in the comments down below! I’d love to help out!